Temperate forests occur in a latitudinal belt between tropical and boreal forests. Most of the world's temperate forests are in the Northern Hemisphere, although Southern Hemisphere occurrences are found in Chile, Argentina, Australia, and New Zealand. North American temperate forests fall into six main groups: (1) temperate evergreen rain forests along the West Coast from California to Alaska, dominated by sitka spruce, western red cedar, and western hemlock; (2) montane evergreen forests of the western mountains, dominated by Douglas-fir, several species of true fir, spruce, and pine; (3) southeastern evergreen pine forests with longleaf and other pines; (4) central deciduous oak-hickory forest; (5) northeastern deciduous beech-maple-hemlock forests; and (6) northern pine forests with red, white, and jack pines. Disturbance regimes include frequent fire in forests on sandy soils (oak and pine), to rare fire (hemlock, maple, and beech-dominated forests). Wind is a common form of disturbance in temperate forests. Mid-latitude, low-pressure systems hit the Pacific Coast, hurricanes traverse the southern and eastern coast of the United States, and severe thunderstorms and tornadoes often form in the interior of the country. On rare occasions hurricanes and severe thunderstorms can level hundreds of square miles of forest. Many species of trees can sprout from the stump after such blowdowns, and seedlings of shade-tolerant species present on the forest floor are also free to grow when the large trees above them blow down. Small gaps caused by the felling of single or small groups of trees by ordinary storms are very common. These gaps are important for maintaining a diversity of tree species in the forest. For example, yellow birch, green ash, and basswood enter the forest primarily through gaps. Deciduous temperate forests are known for their diverse understory of spring-blooming wildflowers, including trillium, violets, bluebells, bloodroot, and many others. A temperate forest in autumn. The central deciduous oak-hickory forest is just one of the six main North American temperate forest groups. the composition of the future forest. In mixed hemlock-maple forests of eastern North America, for example, deer prefer hemlock seedlings and effectively prevent them from successful regeneration. Such forests will eventually be dominated solely by maple. A vast majority of the world's temperate forests have been logged, and nearly half have been converted to croplands, highways, and cities. For example, less than 1 percent of all temperate forest in eastern North America remains in primary (never logged) condition. Logging by clear-cutting is common in coniferous forests and selection cutting—whereby small groups of trees are cut—is common in deciduous forests. Woods from the deciduous forest, such as cherry, walnut, oak, and maple, are used for furniture, woodwork, and flooring. Douglas-fir, longleaf pine, and other conifers are used primarily for lumber. Much of the secondary temperate forest is fragmented in small farmers' woodlots, city parks, and nature reserves. These small fragments (4 to 40 hectares [10 to 100 acres]) face problems from invasive exotic species, high deer populations, and fire exclusion. The combination of these forces can cause massive changes to forest species composition. Bormann, F. Herbert, and Gene E. Likens. Pattern and Process in a Forested Ecosystem. New York: Springer-Verlag, 1979. Davis, Mary B., ed. 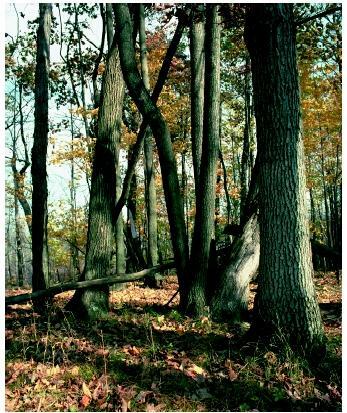 Eastern Old-Growth Forests: Prospects for Rediscovery and Recovery. Washington, DC: Island Press, 1996. Hunter, Malcolm, L., Jr., ed. Maintaining Biodiversity in Forest Ecosystems. Cambridge, UK: Cambridge University Press, 1999.
this is so cool....i used information from this on one of my science projects..and i got a awesome grade!! love this site! !